Crush of the Week and More . 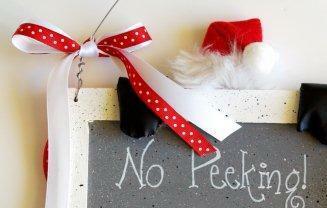 . .
First up – my Guest Post is up at Me Making Do! Here’s a Hint at what I’m sharing . . .
Come on over and check it out! Have you entered all the giveaways? I think she is up to seven now! Second – several of you expressed interest in a Tutorial Request Feature here at Flamingo Toes. I’ve decided to give this a go – with the clear understanding that you won’t be sad if I can’t make your tutorial and that you’ll keep your requests to something within the confines of my abilities. Don’t ask for scrapbooking or knitting or any tutorials that involve sports. If you are still interested in this new Feature – click here. There’s a handy form for you to fill out and you can tell me all about your idea. I’m looking forward to it! Also – this link has been added to the sidebar so you can find it easily in the future. Holly from 504 Main created this Stencilled Faux Pallet Artwork. Ok. First – she made her own pallets. Hello. Then she stenciled on this great design. I need this in my dining room. Actually my dining room needs a lot of help. Maybe I’ll show it to you someday and ask for advice. Maybe not. Emily from Frilly Details refinished this fantastic Dining Room Light. This pretty light used to be yellow! Doesn’t it look great? I love it. I’m eyeing all the things I can spraypaint in the house and Mr. F.T. is reminding me that we rent. My argument is that if I actually improve the light fixtures, they will be so thankful that they lower our rent. For some reason he doesn’t agree. Mandy from Mandipidy (was Mandy’s Yellow Corner – Mandipidy is her new name. Isn’t it great?) 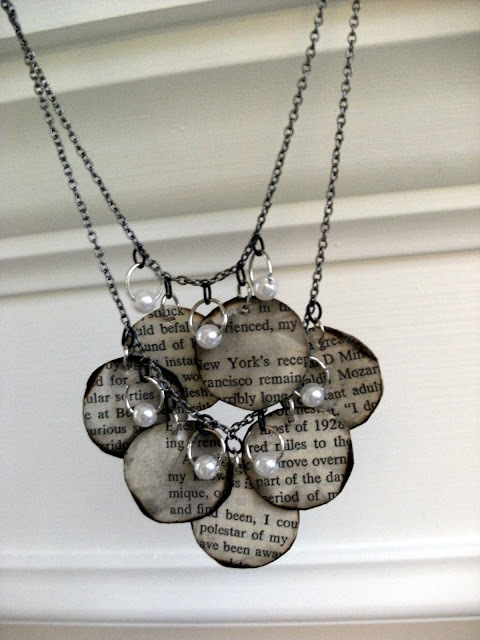 shared her tutorial for the Book Page Necklace. I ADORE this necklace. In fact, I bought one. :) Everytime I wear it I get compliments. It combines my love of reading and jewelry – it’s perfect! She has the whole tutorial on her site so you can make one too. Did I mention I love this necklace? You might have already seen this but I’m sharing it anyway because I’m going to copy it. So I’m knocking off a knockoff. Sweet! It’s Michele from The Scrap Shoppe’s Pottery Barn Knockoff Pillow. I’m so impressed with the technique she used on this – I like hers much better than the original. I have three HUGE blank pillows in my bedroom that have have been mocking me with their un-crafty looks. But no more! I know exactly what I’m going to do now. I hope you enjoyed this special edition of the Crush of the Week and found lots to inspire you. I’ll be back on Saturday with another Shopping Saturday – you come back too and we’ll shop! These are fantastic ideas, but you can’t go wrong with Mandy and Michele (two of my favorite blogland friends)! :) I’m loving that silverware art! My kitchen will soon bedecked with utensils, so I love this idea! What a nice surprise…I am doing a happy dance. Thank you…and thank you for showing off these other finds…I had seen Michele’s pillow (LOVE!) but not the others…they are awesome too! Great features. I adore that necklace!